When did you first introduce a pillow to your little one? My little man is a toddler whether I want to accept it or not. He is still in his crib and no attempts to climb out...yet! So we are going to keep him in there as long as possible. I'm also pretty particular about what I let go in his crib. He's old enough now where SIDS isn't as big of a risk, but that doesn't mean it still isn't a concern of mine. So I went back and forth on a pillow for him. Then Hubby asked, "When do they start sleeping with pillows?" 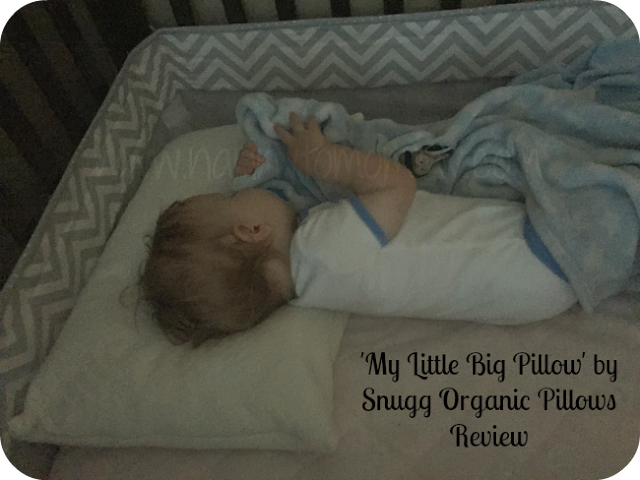 So when I received the opportunity to review the Snugg Organic My Little Big Pillow, I thought well here's my chance to see if he's ready. Of course the first night (and second and third), I kept the baby monitor off of VOX mode so I could see him at all times. But he was fine and I think we made a good choice in toddler pillows. The Snugg Organic My Little Big Pillow is made with premium organic shredded latex and designed for toddlers and children age 2+. I considered this before I let my son use it. I felt he was ready and suggest others parents do the same. If you feel your child isn't ready, then it doesn't matter how old they are, you know them best. I also realize some people are allergic to latex, so if you are I would take this into consideration before making a purchase. 'My Little Big Pillow' has been designed to provide the optimum sleep for children. It's perfect size means it is not too small like most other toddler pillows, yet still the right depth to provide the correct support for your little one's head, neck and spine. 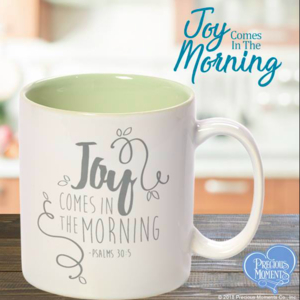 It comes with an organic soft cotton case, is hypoallergenic, dust mite resistant, and durable. And each pillow has a lifelong guarantee. When did you introduce a pillow to your little one? 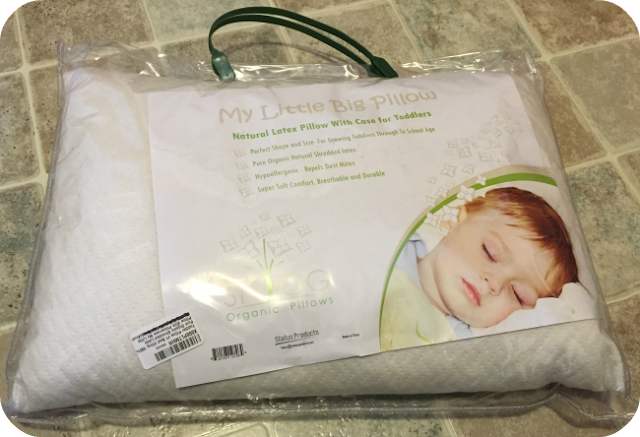 What do you think of the 'My Little Big Pillow' from Snugg Organic? What do you think of using shredded latex? Aww this is so cute! The picture is adorable. 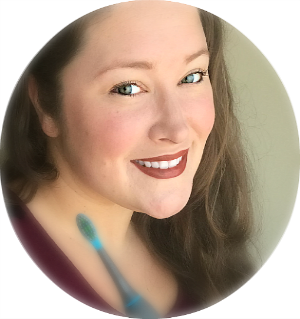 I love how you take real pictures of you using the products in your posts. It really shows how they look "in real life". This pillow sounds nice. I would be worried too at first. You definitely did the right thing and the pillow sounds great. 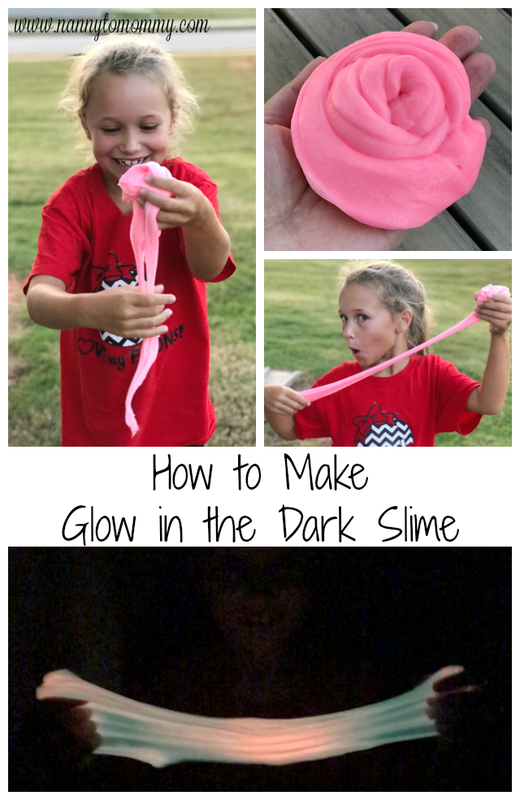 I wish I would have known about this sooner. My oldest has been using a really old pillow of mine (the only one I could find that was low-profile enough for her) and I'm sure it's not very clean or healthy. I'll have to keep this one in mind! Thanks! This pillow is super cute! I have a 2 year old niece and her mom has been talking about getting her a pillow; I'm going to tell her to check this one out. Thanks for the review!